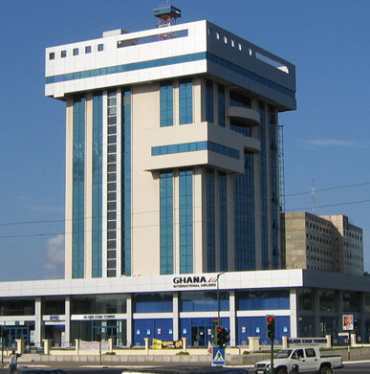 Accra is the capital city of Ghana and also a district in the Greater Accra Region. It is the "nucleus" of the country where all the action takes place. 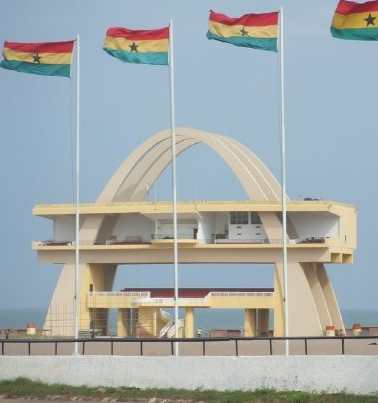 This city became very important when the capital of Ghana(by then, Gold Coast) was moved from Cape Coast in 1877 by the British. 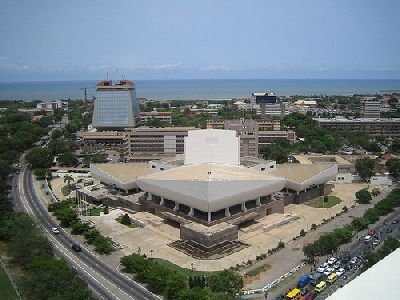 Arieal view of the National Theatre. 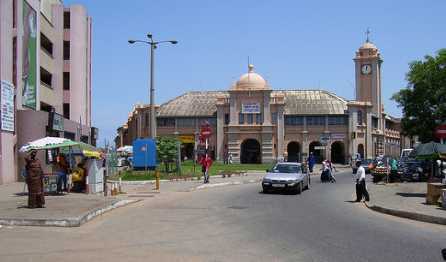 Since then, it has metamorphozied into one of the most important and wealthiest cities in Africa. Over 80% of Ghana's workforce is located within this metro area. Tourists and almost everyone loves this city, because it has an International airport, a Sea port/Habour and Railways for transportation. The beaches, hotels, casinos, restaurants, bars and night clubs and in fact, anything to make life comfortable, is indexed to the highest standards. It is the most populous city in Ghana, with the largest number of foreigners and tourists, thus giving it the modern cosmopolitan lifestyle. People: People here are from all corners of Ghana with the Ashantis(Akans) being the majority. There's also a decent number of foreigners from all parts of the globe. Lifestyle: Accra is a busy city, but easygoing at the same time. 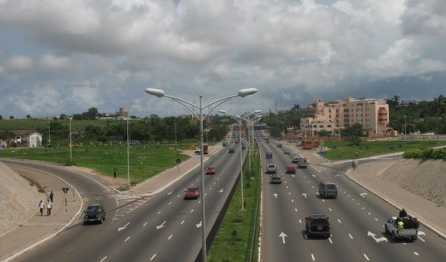 Due to all the advantages it has over the other cities in Ghana, moving around and about is very easy. Taxis can be seen any where, any time. Most of them can be hired from one point to another at reasonable prices. These cabs don't have meters so always make sure to bargain, as drivers often over quote their prices. Some of them run on a specified route and it is sheared with other passengers. It is cheaper and convenient when your destination is close to the route. Mini buses known as Trotro operate the same way, but with a cheaper fixed price. The cheapest form would be the Government metro buses also known as Kuffour Buses(introduced by the current President Ghana). There are so many bars on the streets, where you can sit out and enjoy the fresh breeze, especially at nights. There are uncountable exquisite karaoke bars with foreign assorted drinks and nice high-tech night clubs. There are countless places of interest, to visit when you're in capital. so don't worry about getting lost, just ask! Its a friendly city with nice people. The Independence Square- this is where the independence ceremony on 6th March is performed annually. This city has some of the most beautiful beaches in Ghana. Some of these beaches have 3-5 star hotels in Accra with casinos and they also serve continental dishes. Below is a compiled list of some of the historical and fun places to check out. If you enjoyed Accra, but want to take it easy and cool, then your best alternative would be the Eastern Region. It is very close to Accra, has a cooler climate especially on the hills of Aburi and the Kwahus. This region has many tourist attraction sites, historic places and colourful festivals. Find out from here>>>. Please subscribe to my monthly newsletter, The Ghana Buzz to receive tips, new discoveries and exciting information about Ghana. Your e-mail address is totally secure. I promise to use it only to send you The Ghana Buzz.